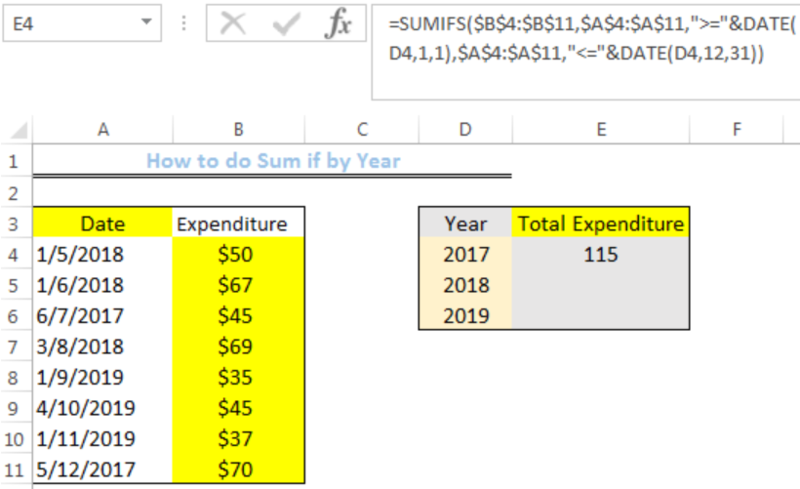 We can use the SUMIFS Function to sum selected cells based on the values of the particular year we wish to add. The steps below will walk through the process. In this formula, the First DATE section is use to instruct that only cells greater than or equal to the DATE specified in Cell D4 are summed. This date is 2017/1/1, where 2017 is the year, 1 is the month, and the last 1 is the day. For the Last Date section in the formula, it instructs that only cells lesser than or equal to the DATE specified in Cell D4 are summed. This date is 2017/12/31. 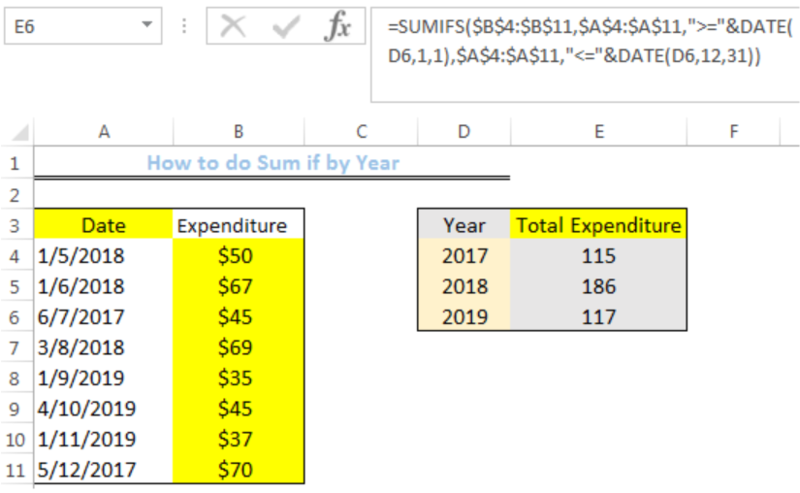 After meeting the criteria for the date_range ($A$4:$A$11), the values in the adjacent cells in Column B are searched for and summed. I have a table of checks with a date in column A and an amount in B. I want formulas to sum by year. =SUMIF(YEAR(A1:A10),2017,B1:B10) gives an error. 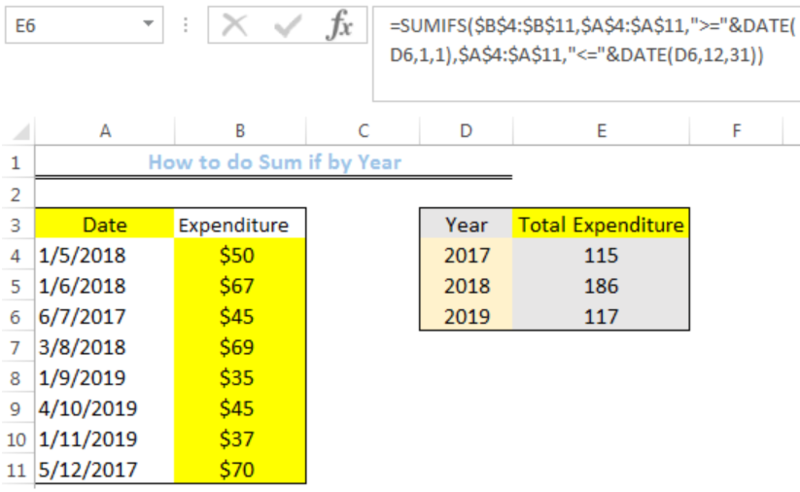 If I add a column C with =YEAR(A1:A10) then =SUMIF(C1:C10),2017,B1:B10) works. Why? 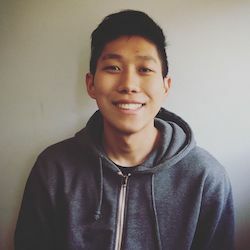 Better way short of a pivot table? Need to sum the month dates into year date --- ex: year 2018 is the sum of all months in 2018. 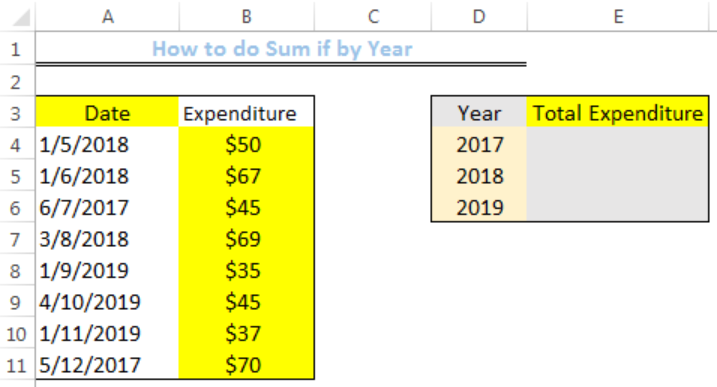 Formula in I6 does not capture entire dates to the right by month into 2021. Same with all cells in green formulas fro cells I6 to N183. See attached.